Seyrantepe V., et al. (2008) Circulation. 117:1973-1981.Hiraiwa M., et al. (1999) Cell Mol Life Sci. 56:894-907. Western Blot analysis of CTSA expression in transfected 293T cell line (H00005476-T01) by CTSA MaxPab polyclonal antibody.Lane 1: PPGB transfected lysate(52.8 KDa).Lane 2: Non-transfected lysate. 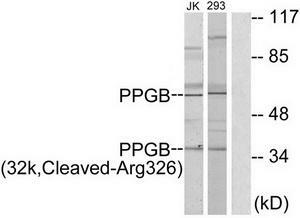 Western blot analysis of extracts from 293/Jurkat cells, treated with etoposide 25uM 1h, using PPGB (32k,Cleaved-Arg326) Antibody. The lane on the right is treated with the synthesized peptide. CTSA antibody (N-term) (Cat. #AP51129PU-N) immunohistochemistry analysis in formalin fixed and paraffin embedded human hepatocarcinoma followed by peroxidase conjugation of the secondary antibody and DAB staining. This data demonstrates the use of the CTSA antibody (N-term) for immunohistochemistry. Clinical relevance has not been evaluated. CTSA Antibody (N-term) (Cat. #AP51129PU-N) western blot analysis in mouse bladder tissue lysates (35µg/lane).This demonstrates the CTSA antibody detected the CTSA protein (arrow). 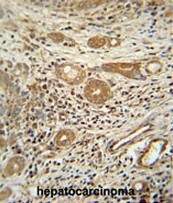 CTSA Antibody (N-term) (Cat. #AP51129PU-N) western blot analysis in HepG2 cell line lysates (35µg/lane).This demonstrates the CTSA antibody detected the CTSA protein (arrow). 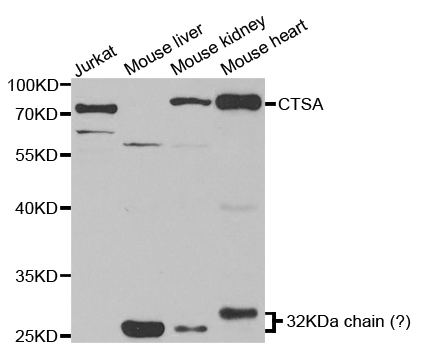 Western blot analysis of Cathepsin A 32k expression in HepG2 (A); mouse kidney (B); rat liver (C) whole cell lysates. 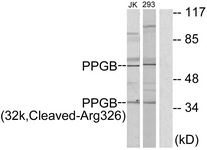 Western blot analysis of extracts from Jurkat cells and 293 cells, treated with etoposide (25uM, 1hour), using PPGB (32k, Cleaved-Arg326) antibody.The lane on the right is treated with the synthesized peptide. Western blot analysis of extracts of various cell lines, using CTSA antibody. 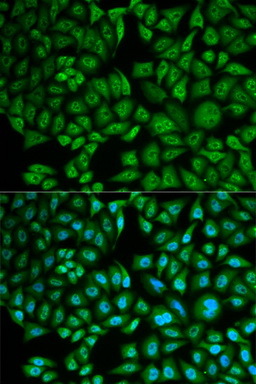 Immunofluorescence analysis of MCF-7 cell using CTSA antibody. Blue: DAPI for nuclear staining.